Properties in Pampaneira average 4.6 out of 5 stars. Property 7: Private and secluded cottage with garden and pool. Property 8: Garden & Animal Paradise between the coast and the mountain foothills. 'El Nido' Peaceful holiday cottage with private pool and gardens. Dog friendly. 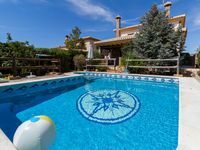 Property 23: 'El Nido' Peaceful holiday cottage with private pool and gardens. Dog friendly. 3 bedroom, two bathrooms with barbecue, large swimming pool and AA. Property 26: 3 bedroom, two bathrooms with barbecue, large swimming pool and AA. My family spent four nights in Durcal. We are from the US and this was our last stay inSpain. The house in Durcal is located in a beautiful part of Spain. It was our last stay and we found the pool very relaxing and even better than pictured. The house was spacious and laid out nicely. There were five of us staying there and plenty of space. The bedrooms had comfortable beds and lots of storage space. Antonio met us on arrival and did a great job of recommending restaurants, grocery stores, and sights. We drove to Granada and also to Nerja, on the Mediterranean. Both these were easy drives from the house and absolutely beautiful. We fixed breakfast every morning. They had adequate cooking equipment but the coffee pot didn't work and the nonstick fry pan needed replacing. These were minor things but suggestions of how the kitchen could function better. 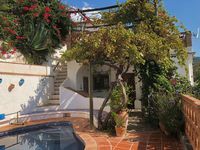 We had a wonderful time and would recommend this property to anyone going to Southern Spain and wanting to get a glimpse of the lovely villages in the Sierra Nevada mountains.